While we think everyday should include giving hugs and kisses to our loved ones, there is definitely something about Valentine's Day that brings out both our affectionate and playful sides. What better way to celebrate such a day than with some easy vegan tie-dye sugar cookies that you can make with your littlest loves? 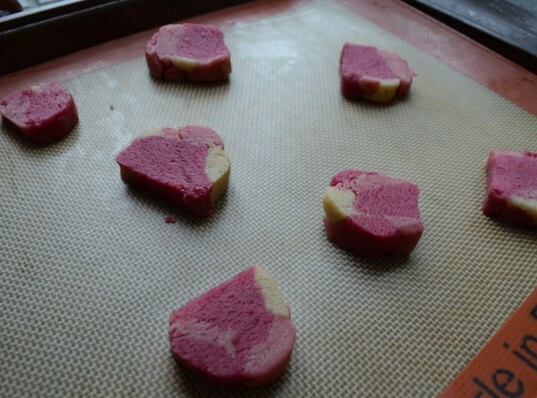 I have been wanting to make tie-dye cookies for ages, and when I came across this post and saw how hands-on the process was, I knew they would be the perfect baking treat for my kids to participate in. 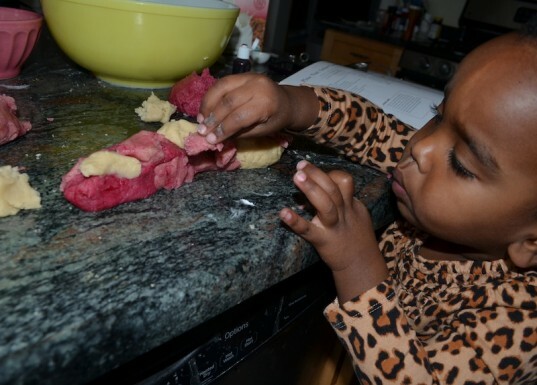 My two-year-old loved helping with the dough and making the cookie log, so it truly is a great recipe for almost every age! I used a basic vegan sugar cookie recipe from The Joy of Vegan Baking, but you can use your favorite recipe too. Show some love to the animals and make it vegan if it isn't already! I used the red coloring from India Tree's Nature's Colors Decorating Set, made from vegetable colorants and made without synthetic dyes or corn syrup. There's some pretty scary stuff in most mainstream food dyes, so seek out natural options instead. 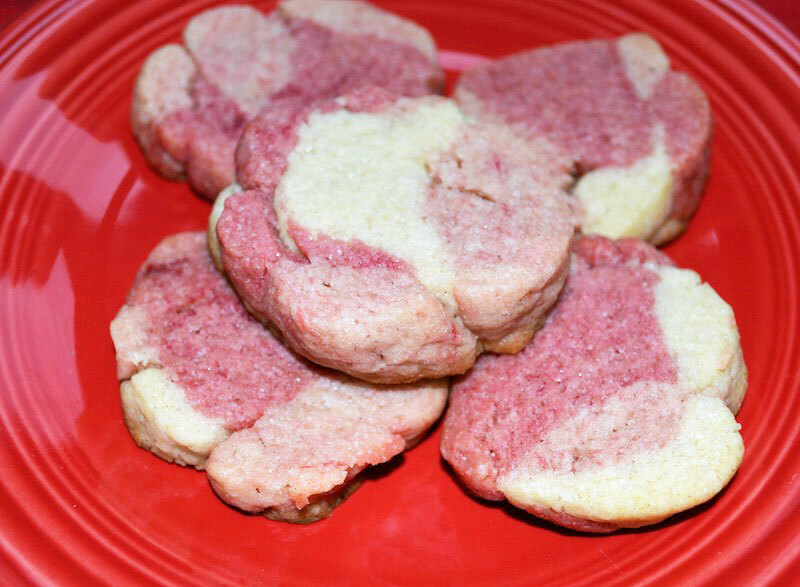 Read on for directions on how to make fun and festive vegan tie-dye sugar cookies, and find one-page, printable directions here. 2. Make the cookie dough. Line 2 baking sheets with Silpats or parchment paper. In a bowl, combine the flour and baking powder. 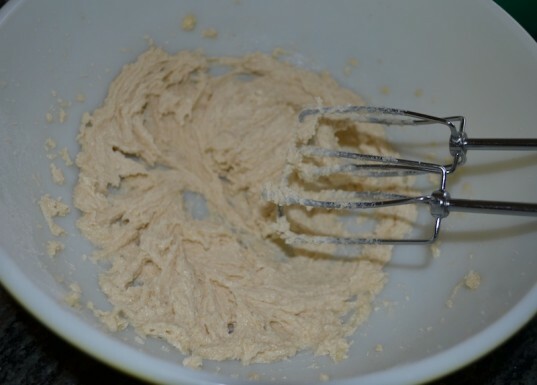 In another, large bowl, cream the the sugar and non-dairy butter together with a hand-held mixer and beat for about 3-4 minutes, until light and fluffy. Add the egg replacer, water, and vanilla extract and beat for about another minute. Add the flour mixture and beat until it forms a smooth dough. Add up to an additional two tablespoons of milk, adding a bit of liquid at a time, if the dough seems dry. 3. Divide the dough and color. Divide the dough into three pieces. They do not have to be equal. I made the uncolored dough piece the smallest, and the pieces of dough that I would be dyeing bigger. 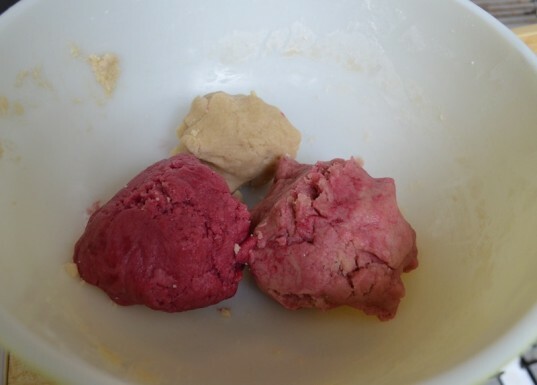 Add the India Tree natural food colorant a few drops at a time to the balls of dough that you want to be pink and red. Work the dye in well with your hands until the dough is a uniform color and not streaky. Add additional drops of dye as needed. 4. Make the cookie log. Bring in your little helpers to make your cookie log. To facilitate the process, I rolled base pieces of the three colors and stuck them together. Then we tore off small pieces of dough and stuck them around the base pieces. Getting a mix of the colors and sticking them on in different sizes and places will ensure a prettier tie dye at the end! 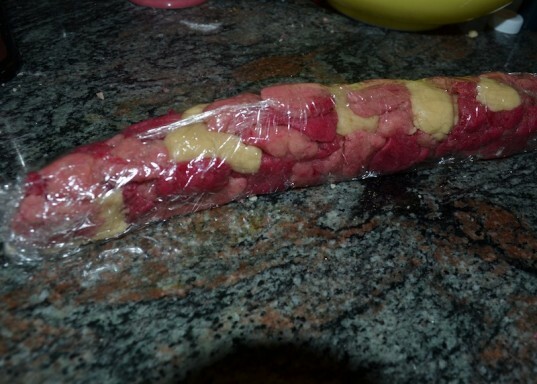 Using plastic wrap, gently roll up your log. Refrigerate until the dough is firm but still easy to cut, about an hour to an hour and a half. 6. Cut the cookie log. Preheat the oven to 350 degrees. Remove the log from the fridge, unwrap, and cut the dough into coins about 1/2 inch thick. Place on the prepared baking sheet. Bake the cookies in the preheated oven for about 12-13 minutes. The cookies will brown slightly around the bottom edges. Remove from the oven, let cool, and serve. Enjoy! Gather the ingredients. Then, make the dough. Line 2 baking sheets with Silpats or parchment paper. In a bowl, combine the flour and baking powder. In another, large bowl, cream the the sugar and non-dairy butter together with a hand-held mixer and beat for about 3-4 minutes, until light and fluffy. Add the egg replacer, water, and vanilla extract and beat for about another minute. Add the flour mixture and beat until it forms a smooth dough. Add up to an additional two tablespoons of milk, adding a bit of liquid at a time, if the dough seems dry. Divide the dough into three pieces. They do not have to be equal. I made the uncolored dough piece the smallest, and the pieces of dough that I would by dyeing bigger. Add the India Tree natural food colorant a few drops at a time to the balls of dough that you want to be pink and red. Work the dye in well with your hands until the dough is a uniform color and not streaky. Add additional drops of dye as needed. Bring in your little helpers to make your cookie log. To facilitate the process, I rolled base pieces of the three colors and stuck them together. Then we tore off small pieces of dough and stuck them around the base pieces. Getting a mix of the colors and sticking them on in different sizes and places will ensure a prettier tie dye at the end! Using plastic wrap, gently roll up your log. Refrigerate until the dough is firm but still easy to cut, about an hour to an hour and a half. Preheat the oven to 350 degrees. Remove the log from the fridge, unwrap, and cut the dough into coins about 1/2 inch thick. Place on the prepared baking sheet. Bake the cookies in the preheated oven for about 12-13 minutes. The cookies will brown slightly around the bottom edges. Remove from the oven, let cool, and serve. Enjoy! Divide the dough into three pieces. They do not have to be equal. I made the uncolored dough piece the smallest, and the pieces of dough that I would by dyeing bigger. 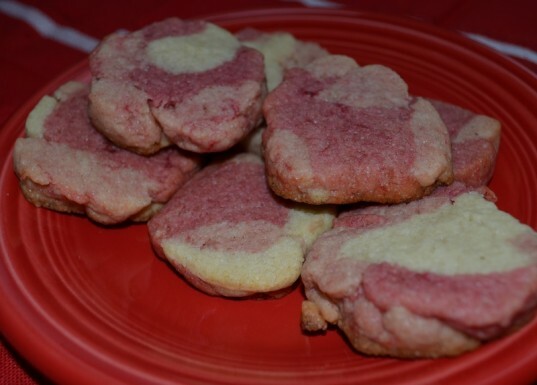 Add the India Tree natural food colorant a few drops at a time to the balls of dough that you want to be pink and red. Work the dye in well with your hands until the dough is a uniform color and not streaky. Add additional drops of dye as needed. 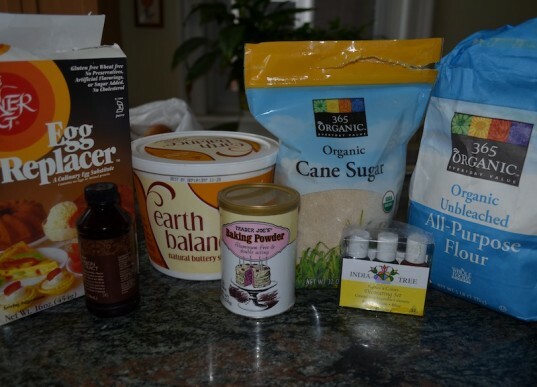 Recipe very slightly adapted from The Joy of Vegan Baking, makes about 20-24 cookies 1 3/4 cups flour 1/2 tsp baking powder 1/2 cup nondairy butter, such as Earth Balance 3/4 cup granulated sugar 1 1/2 tsp Ener-G Egg Replacer 2 Tbsp water 1 tsp vanilla extract India Tree Nature's Colors Decorating Set colorant in red 2 Tbsp non-dairy milk, or as needed Gather the ingredients. Then, make the dough. Line 2 baking sheets with Silpats or parchment paper. In a bowl, combine the flour and baking powder. In another, large bowl, cream the the sugar and non-dairy butter together with a hand-held mixer and beat for about 3-4 minutes, until light and fluffy. Add the egg replacer, water, and vanilla extract and beat for about another minute. Add the flour mixture and beat until it forms a smooth dough. Add up to an additional two tablespoons of milk, adding a bit of liquid at a time, if the dough seems dry. Divide the dough into three pieces. They do not have to be equal. I made the uncolored dough piece the smallest, and the pieces of dough that I would by dyeing bigger. Add the India Tree natural food colorant a few drops at a time to the balls of dough that you want to be pink and red. Work the dye in well with your hands until the dough is a uniform color and not streaky. Add additional drops of dye as needed.